As part of this campaign we have decided to start a series to highlight our portfolio organizations and how they are working to #AdvanceEquity. This week we will be highlighting FoodCorps. The following post was written by Syed Ali, FoodCorps. At the root of food insecurity and health disparities in America is inequity. Race, place, and class can determine if a child has knowledge of and access to healthy foods, which can in turn determine health outcomes. 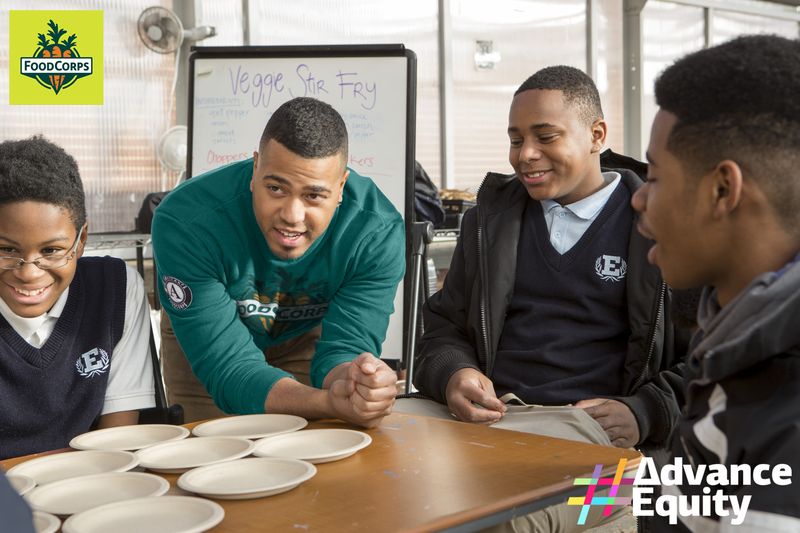 FoodCorps, an organization that connects kids to healthy food in school, believes that all of our nation’s children—regardless of these factors—should know what healthy food is, care where it comes from, and be able to eat it every day. By encouraging this culture of health in schools that need it most, our AmeriCorps service members are giving the students there a chance for better health outcomes and the better life opportunities that come with them. In order to accomplish our goal, we know that it’s imperative that we integrate strategies for diversity, equity and inclusion in every facet of our work. We’re fostering diversity on our team—our staff, the 205 AmeriCorps service members we place in schools, and the network of community partners guiding their service locally—to ensure that we build our program with a variety of perspectives and to ensure that children are learning from service members who look like them and understand their experiences. We’re engaging this team of staff, corps members and partners in trainings that enable us all to dismantle inequities where we find them. Our state partners are selecting the schools we serve based on factors such as high rates of need for free and reduced lunch to make sure we’re reaching the kids who need our program most. We’re deliberately crafting our program and how we talk about it with the intent of helping ourselves and the systems that surround us grow progressively more equitable. This means everything from translating our materials into other languages to featuring culturally relevant healthy foods in our lessons and in cafeterias. As an AmeriCorps program, we have a tremendous opportunity to cultivate leadership in a generation of food system leaders. We’re providing our corps members the tools to continue to be change makers after their national service, and investing specifically in our alumni of color is one key opportunity for us to advance equity. We convened a gathering of such alumni for the first time last fall so that we could work together to understand how identity, culture, and experience shape food and health in the United States. Since then, this cohort has been working to change the face of healthy food in America so it better matches them and the communities they served with FoodCorps. They are exploring how food education and preventative health businesses can incorporate values into their bottom lines; investigating how to bring more equitable representation to decision-making tables; and discussing how to spread learning tools like videos, recipe books, and lesson plans that feature people of color and traditional foods. Together, with our alumni, our partners, our corps members and our funders, we’re continuing to wrestle with difficult questions and explore strategic shifts so we can build not just a better and more equitable FoodCorps but a more just world around it. We cannot achieve our mission if we don’t.